Cristiano Ronaldo sustained an injury during Portugal’s clash with Serbia on Monday night, handing Juventus a real scare over his availability. The 34-year-old has been crucial for the Bianconeri so far this season, scoring 24 goals and providing 12 assists in 36 appearances to establish himself as their talisman in pursuit of major honours. With that in mind, the last thing that coach Massimiliano Allegri needs is for the Portuguese superstar to suffer an injury setback, but as seen in the video below, that’s exactly what he suffered during the Euro 2020 qualifier against Serbia. Ronaldo appeared to pull up with a hamstring injury after sprinting after the ball, immediately signalling over to the bench that he would need to be replaced. In turn, that raised immediate fears from a Juventus perspective as to whether he could miss key games between now and the end of the season. Ultimately, an eighth consecutive Serie A title looks likely as Juventus boast a 15-point lead with 10 games remaining. 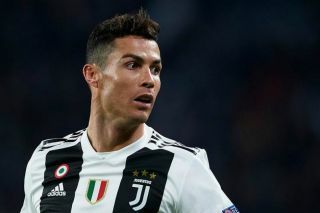 However, with just over two weeks until they face Ajax in the quarter-finals Champions League tie, they will be desperate to have Ronaldo back fit by then. Based on his comments below, it sounds as though he’s confident he’ll feature. “Two weeks and I’ll be ok,” he is quoted as saying by Sportmediaset. That leaves him racing against time to make the first leg in Amsterdam on April 10, while he could miss games against Empoli, Cagliari and AC Milan in Serie A before then.